Driven by the augmenting need for sophisticated and hygienic medical and healthcare facilities, the global market for hospital linen supply and management services is likely to witness a sturdy rise in the forthcoming years. The market, which stood at US$7.4 bn in 2015, is projected to expand at a CAGR of 2.40% between 2016 and 2024 and reach a value of US$9.1 bn by 2024. In addition, the rise in the outsourcing of hospital linen supplies is likely to support the growth of this market significantly in the near future. The increasing addition of value added services to the portfolio of leading players is also expected to boost the market substantially over the years to come. The key products of the global hospital linen supply and management services market include bed sheet/pillowcases, patient repositioner, blankets, bathing/cleansing accessories, and bed pads/under pads. Among these, bed sheets/pillowcases have been registering a greater demand and the scenario is expected to remain same over the forthcoming years. Bathing/cleansing accessories are also expected to witness a strong demand from consumers across the world in the near future on account of the increasing awareness pertaining to hygiene and the need for sanitation maintenance. The worldwide market for hospital linen supply and management services is spread across Europe, Asia Pacific, Latin America, North America, and the Middle East and Africa. Thanks to the presence of advanced healthcare infrastructure and of state-of-art medical facilities, North America has emerged as the key contributor to the global market. The soaring count of hospitals is likely to fuel the demand for hospital linen in this region, leading to the continued dominance of North America on this overall market over the forthcoming years. Asia Pacific is also projected to experience an upswing in the market for hospital linen supply and management services in the near future. The ongoing construction of a number of big healthcare institutes, hospitals, and clinics in Asian economies, such as China and India, is expected to act as the key driving force behind the growth of this regional market over the next few years. On the other hand, the markets in Europe, Latin America, and the Middle East and Africa are likely to witness steady growth over the forecast period. 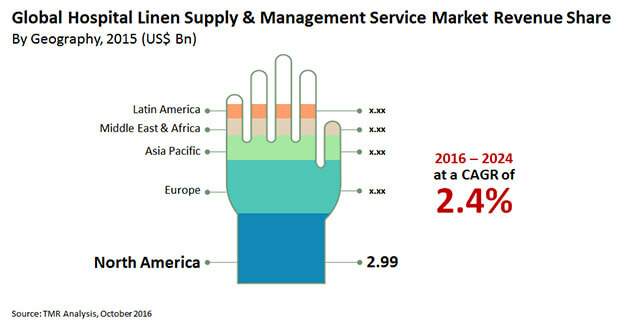 The continual addition of value added services, such as rental services and distribution of linen in bulk, is anticipated to drive the Europe market, whereas, the markets in the Middle East and Latin America are projected to be propelled by rising awareness among consumers regarding hygiene and sanitation. The U.K., the U.A.E., and Brazil are anticipated to acquire the leading positions in their respective regions. AmeriPride Linen & Uniform Services, Tetsudo Linen Service, Unitex Textile Rental Services, Emes Textiles Pvt. Ltd., Sobel Westex Inc., Angelica Corp., E-town Laundry Co., Healthcare Services Group Inc., ImageFIRST Healthcare Laundry Specialists, and Synergy Health Plc are some of the leading players in the global market for hospital linen supply and management services. This report on the global hospital linen supply and management services market presents a comprehensive analysis and forecast of this market on a global and regional level. The study provides historic data of 2015 along with forecast for the period between 2015 and 2024 based on revenue (US$ Bn). The drivers and restraints governing the dynamics of the market along with their impact on demand during the forecast period have also been discussed in this study. Further it includes potential opportunities in the hospital linen supply and management services market on the global and regional level. The report provides the size of the hospital linen supply and management services market in 2015 and the forecast for the next nine years up to 2024. The size of the global hospital linen supply and management services market is provided in terms of revenue. Market revenue for regions is defined in US$ Bn. The market size and forecast for each product segment is provided in the context of global and regional markets. Numbers provided in this report are derived based on demand generated from different products, end users and types of materials. Market dynamics prevalent in North America and Europe have been taken into account for estimating the growth of the global market. End users segments hospitals, clinics, other healthcare institutes have been analyzed based on current trends and future potential. The market has been estimated from 2016 to 2024 in terms of revenue (US$ Bn). Regional segmentation includes the current and forecast demand for North America, Europe, Asia Pacific, Middle East & Africa, and Latin America. These have been further sub-segmented into countries and regions which are relevant to the market. The segmentation also includes demand for individual products, materials and end users in all regions.